Dubious Quality: Buried, and Why Do My Arms Hurt So Much? We've gotten about 15 inches of snow in the last five days, as far as I can tell. We went from October weather in December to Alaska weather in about a three day period. That colored stick in the yard? Apparently, we just bought the stick, not the plowing service. Or, at least, that's what it seemed like this weekend, when we had at least 8 or 9 inches of snow on the driveway. I started out wearing three layers of clothing and a heavy coat. I shoveled a while. I was getting hot, so I took off a layer. Then I took off another layer. By the time I was done--90 minutes later--all I had on was a t-shirt and a coat, and I was sweating like a pig. Snow doesn't look heavy, and this wasn't wet snow (which is apparently made by the devil, from what I've been told). But if you do the same thing three hundred times--scooping, lifting, carrying, dumping--it starts to feel like you're lifting tanks. Your arms hurt. You get a headache. You slip around. Well, I do, anyway. I was sapped when I came in. 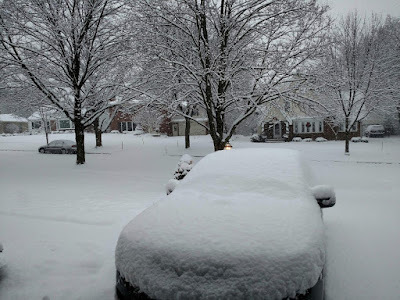 Gloria called the alleged plowing service and they said they did plow Saturday night, but the snow fell so fast that you couldn't tell by Sunday morning. Seems reasonable, given how hard it was snowing. Plus, everyone up here is sick. I don't know if this is a uniquely Northern phenomenon or what, but it seems like half the city is sniffling or coughing or sneezing. Me, too--I caught something a month ago, rode it out, then caught something else. I can't seem to get well, and neither can anyone else. On the positive side, my snowshoes are coming this week, so I'll have a new way to exercise outside without killing myself for the next few months.